SHENANDOAH, TEXAS (December 14, 2018) The No 2 Mary Hardin-Baylor Crusaders came back from a 10-0 deficit in the first quarter to down the No. 1 Mount Union Purple Raiders by the score of 24-16 to win the NCAA Division 3 Football Championship at Woodforest Bank Stadium in Shenandoah, Texas. 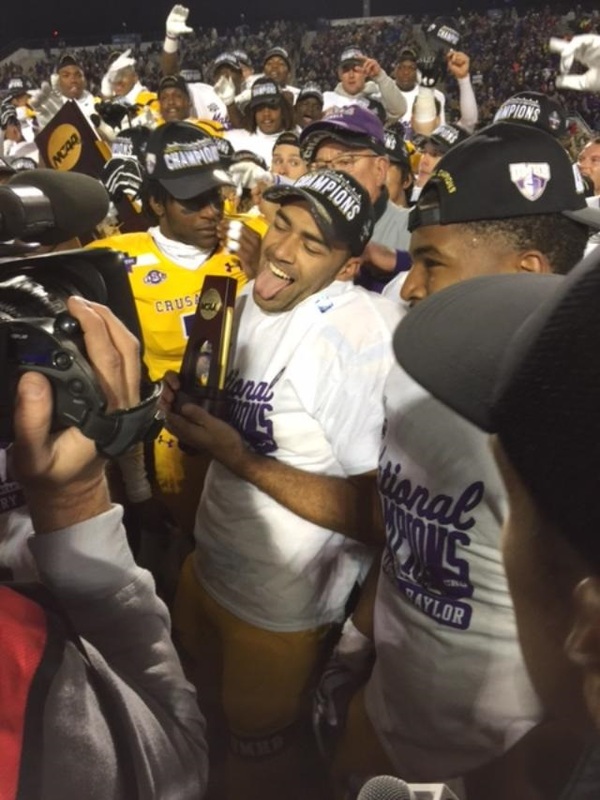 The win was the second national title for the Cru in the past three years; having won the Stagg Bowl in 2016. After a missed field goal by the Crusaders in the first quarter, Mount Union drove the ball 55 yards, on their second possession, to enable kicker Cory Barnett to boot a 55-yarder for the first score of the game. The Purple Raiders used 11 plays and 3:58 to score. Beginning on their own 23-yard line, after the ensuring kickoff, UMHB quarterback Jase Hammack fumbled the ball on a second and 10 play, with safety Austin White recovering on the 23-yard line. Five plays later, D'Angelo Fulford carried the ball the final yard for the touchdown. Barnett tacked on the extra point; giving Mount Union a 10-3 lead with 3:29 remaining in the first quarter. A bit over two minutes later, the Cru drove 62 yards in four plays to cut Mount Union's lead tofourth play of the three. On the series, Hammack connected with T.J. Josey with a 36 yard pass for the score. Anthony Avila recovered from missing the earlier field, booting the extra point to cut the Union lead to 10-7. Josey (shown left) finished the game with five catches for 78 yards and one TD. As a result, he was selected as the Outstanding Player of the Game, by a vote of the sports writers. Early in the second quarter, the Purple Raiders responded with another Barnett field goal; this time a 22-yarder, to push their lead to 13-7. After a good deal of back-and-forth, the Cru saw momentum swing their way as they used seven plays to cover 60 yards in 2:34 to take the lead in the game. Thirty-eight second reminded on the clock when Markeith Miller rushed the final two yards for the score. Avila tacked on the extra point to give MHB a 14-13 lead at halftime. The Cru increased their lead to 17-13 at the 11:01 mark in the third quarter when Avila again split the uprights with a 30-yard field goal. They increased their lead to 24-13 at the 9:46 mark in the fourth quarter with a Hammack pass to K.J. Miller for another six points. Avila again added the kicking conversion. Barnett added a 21-yard field goal with 7:06 left in the game to close out scoring.